Credit: ESO (left) and Gerd Weigelt (right). A revolutionary study involving researchers from the Max Planck Institute for Radioastronomy (MPIfR) in Germany, Trinity College Dublin in Ireland, and NASA in the USA, has obtained the sharpest ever images of one of the heaviest stars in our Galaxy. The images show Eta Carinae and its violent collision of winds in stunning detail, providing new information on how stars evolve and die. Eta Carinae is the heavyweight champion in our galaxy, shining with a power equivalent to 5,000,000 Suns. It is surrounded by the beautiful Homunculus nebula, which contains the remains of material ejected in 1843 when Eta Carinae was one of the brightest stars in the sky. At the heart of the nebula, another monster companion star is evaporating while it orbits Eta Carinae. They are blowing powerful outflows that are colliding between the two at a speed of 10,000,000 km/h. The violent outflowing winds as seen in Eta Carinae herald the end of a star's life as a supernova, and their study provides scientists with clues about how such stars evolve and die. The team used a new imaging technique, called interferometry, which combines the light from three large telescopes to obtain extremely sharp images. The new Eta Carinae observations could only have been made with the European Southern Observatory (ESO) telescopes. 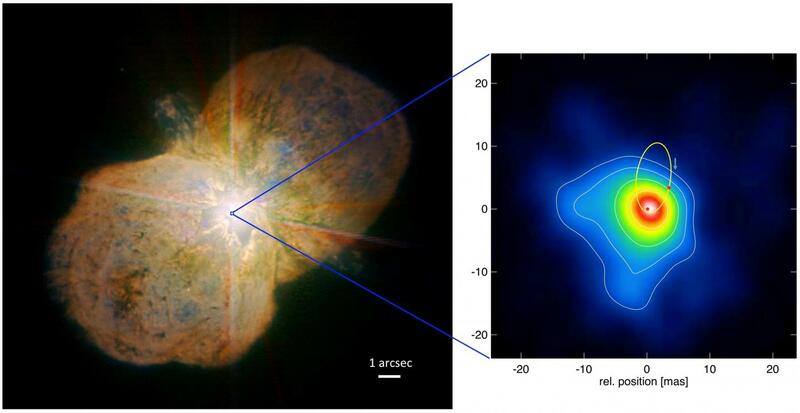 The team, led by Professor Gerd Weigelt (MPIfR), combined the infrared light of Eta Carinae employing three movable 1.8-metre telescopes of the ESO's Very Large Telescope Interferometer. Very sharp and detailed images can be obtained when the movable telescopes are located very far apart. Because of that, the final images are as sharp as if they had been observed from a giant 130-metre telescope. Professor of Astrophysics at Trinity College Dublin, Jose Groh, said: "These are unprecedented images obtained with the ESO telescopes. We were able to zoom in and see the heavyweight champion in our Galaxy like never before. The images provide us with a front-row view of how monster stars interact with each other. The heavier star is winning for now, but the faster companion star may change the fate of the system in the future." Extreme physical processes occur when the powerful winds collide in Eta Carinae. In the collision region, the hot gas emits strong amounts of light. The astronomers used this light to produce the new images of Eta Carinae. By dispersing and analyzing the light from Eta Carinae, the team could determine how the gas moves in the zone where the winds collide. In the past, it was not possible to resolve this violent collision zone, because its extension is too small even for the largest telescopes. Professor Gerd Weigelt added: "Our dreams came true, because we can now get extremely sharp images in the infrared regime. The ESO interferometer provides us with a unique opportunity to improve our physical understanding of Eta Carinae and many other monster objects."